OpenCart is a free and open source web based eCommerce online store management system for a better shopping cart solution. It is a foundation for building an online store allowing the shop owners to make business to their products or shop with the power of internet. 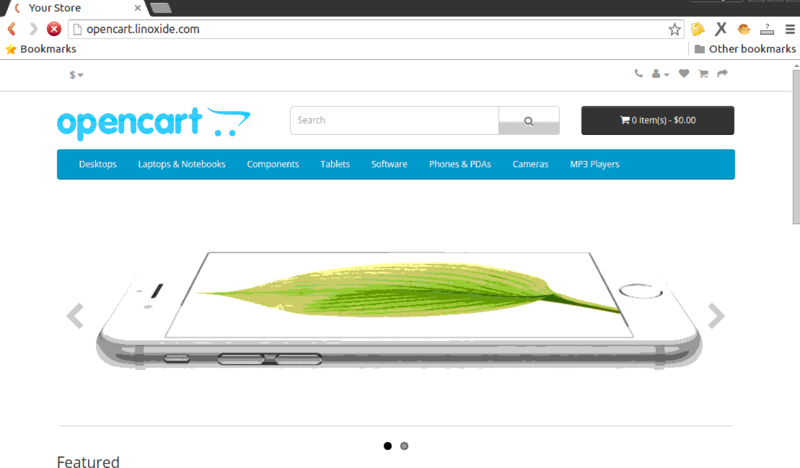 It has a beautiful user interface making it pretty handy to anyone who is running their online store with OpenCart. 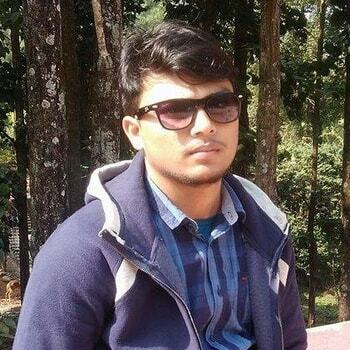 It has pretty bunches of awesome features and is highly extensible. It is one of the most popular eCommerce software out there in the internet. OpenCart features unlimited categories, products, manufacturers, multi currency, language, product reviews, ratings, automatic image resize and more over 20+ payment gateways with 8+ shipping methods. There are pretty cool free documentation written by the OpenCart community with both free and commercial technical support. 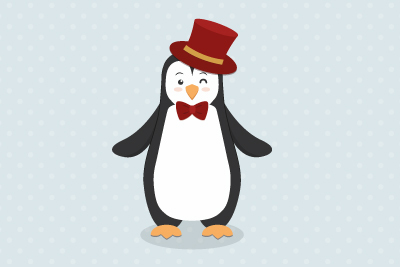 In this article, we'll learn how to setup OpenCart in our machine running Ubuntu and CentOS as operating system. OpenCart needs a webserver running to be available to the public via web browser, a database server to store its data and as its a PHP application, we'll surely require PHP modules to make it work. So, to fulfill all those needs, LAMP Stack is the best stack to make everything working in place. LAMP stack is the collection of Apache Web Server, MySQL/MariaDB Databse Server and PHP5 with required PHP modules. To install LAMP Stack, we'll need to run the following commands with respect to the distribution of linux we are running on our machine. First of all, we'll need to update our system's packages which will fetch the repository index from its mirrors. 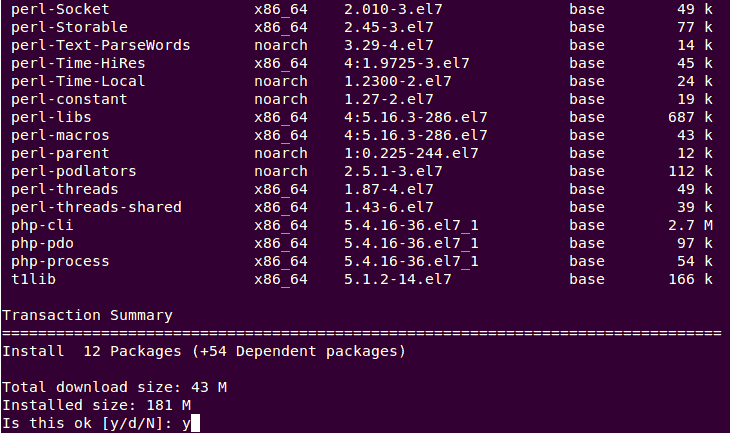 Once done, we'll need to add EPEL Repository to our CentOS machine so that we can install all those modules and packages necessary to setup OpenCart and then go ahead on the installation of those packages. 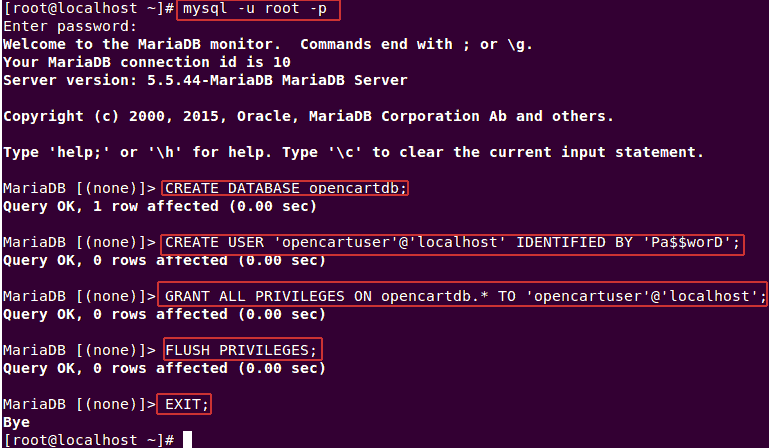 As its our first time we have installed MariaDB,we'll need to configure a root password for our MariaDB server. To configure MariaDB, we'll first need to restart our MariaDB server by running the following command. If we're running a distribution of linux like CentOS 7, Ubuntu 15.04/15.10 shipped with systemd as an init system, we'll need to run the following systemctl command to restart MariaDB. But if we're running a distribution of linux like Ubuntu 14.04, we'll need to run the following service command to restart it. After its done, we'll configure our MariaDB and assign a root password. To do so, we’ll need to run the following command. Note: Please note that, we'll need the above entered root password later inorder to create a new database for our OpenCart installation. After we’re logged in into the mariadb command prompt, we’ll gonna create the database. Finally, we’ve successfully created a database named opencartdb with username opencartuser and password as Pa$$worD . Note: It is strongly recommended to replace the above variables as your desire for the security issue and please note them down somewhere so that we can use those details later while installing OpenCart. Now, we'll go for downloading the latest release (during the time of writing this article) of OpenCart ie version 2.1.0.2. We can download the latest release from the official download page but as we're gonna download it via console or terminal, we'll simply get the link from the site and download it using the following wget command. Once the download is completed, we'll simply extract the compressed zip file by running the following unzip command. 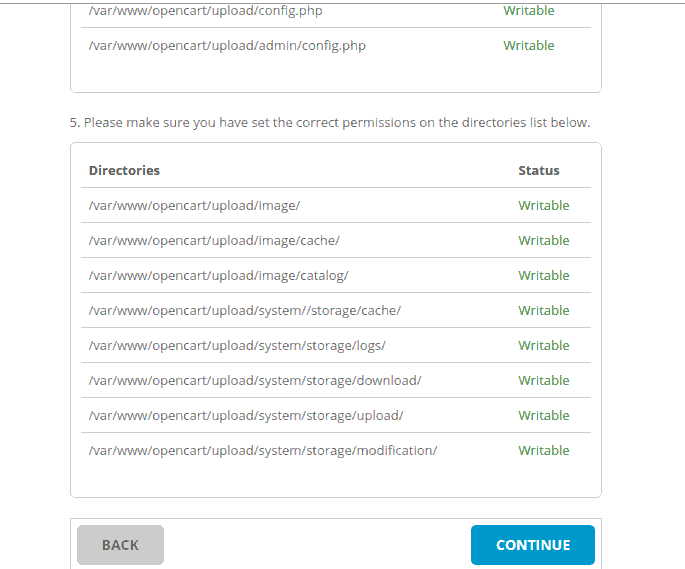 We'll then move the extracted files and directories to /var/www/opencart/ directory where we'll store our opencart website files and make it as the webroot for our domain using apache web server. Next, we'll create a new apache configuration file named opencart.conf under /etc/httpd/conf.d/ directory using a text editor. To do so, we'll need to execute the following command in a terminal or console. Once done, we'll need to simply save the file and exit the text editor. Our version of OpenCart requires us to create a configuration file for it. To do so, we can simply rename the existing config-dist.php files to config.php located under the OpenCart's directory. 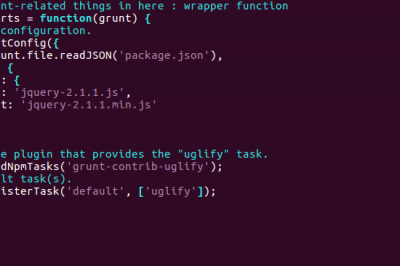 We can execute the following command to rename config-dist.php files to config.php in the respective directories. We'll now need to change the ownership of the directory where our opencart files are extracted to apache user so that apache process owner can have full read/write access over that directory. Once all the configuration and setup is done, we'll need to restart our apache web server and mariadb and make it able to start automatically in every boot of the system. To do so, we'll need to execute the following commands with respect to the distribution we are running. In order to expose our OpenCart online store on the internet or inside the same network, we'll need to make port 80 open from the firewall program. To allow port 80 or http service, we'll need to run the following commands according to the firewall program installed and running in our system. As linux distributions like Ubuntu 15.04/15.10, CentOS 7 are shipped with systemd, firewalld are popular firewall programs installed. So, we'll need to run the following firewall-cmd commands to open http services. Distributions like Ubuntu 14.04 are shipped with sysvinit as init system so, iptables are used as firewall program so, we'll need to open port 80 by running the following. 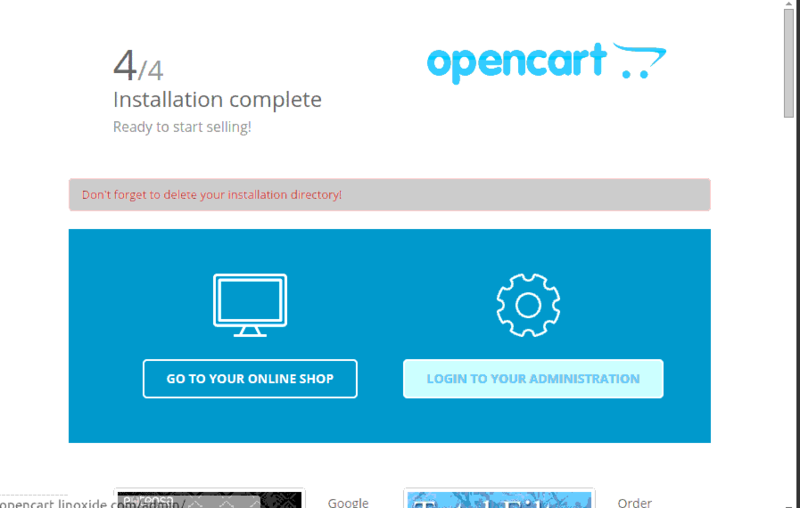 Finally after everything is set as expected above, we'll now go for the OpenCart web based installation process. To do so, first we'll need to point our web browser to our server's ip address or domain name as http://ip-address/ or http://domain.com/ according to our configuration. 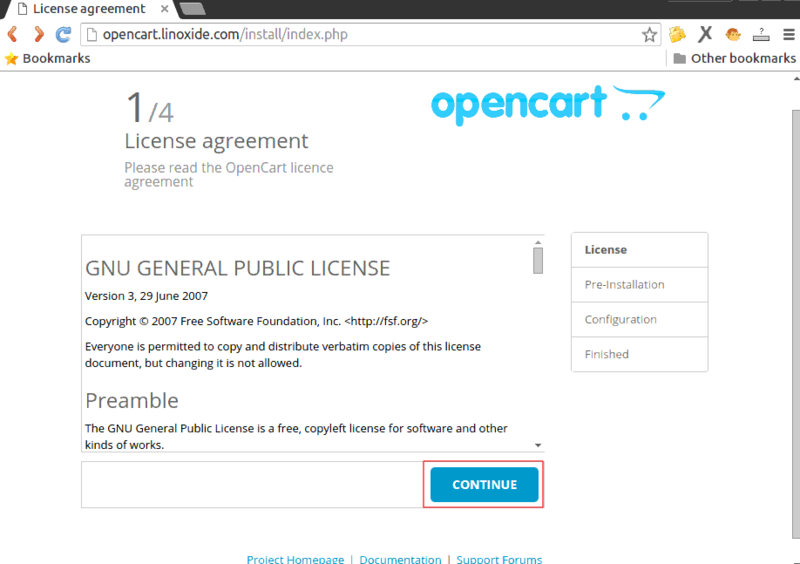 Here, in this tutorial, we'll point our web browser to http://opencart.linoxide.com/ and start the installation process as shown below. To continue the installation further, we'll click on CONTINUE button as shown in the above image. This will load another page of installation where every pre-installation configurations are checked. As we have fulfilled every requirements to run OpenCart, we'll see every status in green color as shown below. Next, we'll click on Continue to move ahead towards the Configuration page. Here, we'll need to enter the required database login credentials we had set above while creating the database for our OpenCart installation. 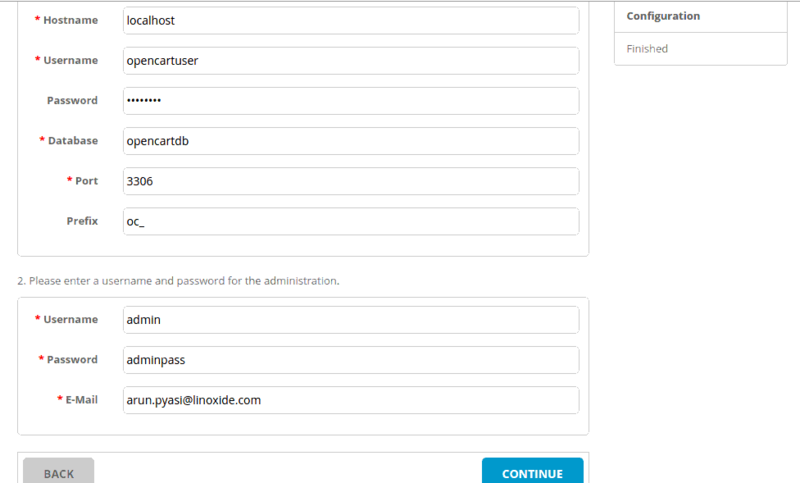 Then, we'll set an username, password and email which we'll require further to login into the admin panel. Once done, we'll go further to complete the installation. Then, we'll be welcomed by a Installation Complete page as shown below where we'll be asked whether to go to the Store page or to the administration panel. Now, to goto our Online Store, we can point our browser to our domain or the path where we had installed it ie. http://opencart.linoxide.com/ . Then, we'll see the first screen of our store powered by OpenCart. In order to login to the administration panel, we'll need to point our browser to admin path ie. http://opencart.linoxide.com/admin . Then, we'll need to enter the login details of the panel which we had set above. If you encountered missing extension under mCrypt section while performing the OpenCart Pre-installation check, we'll need to run the following command to fix it. Then, we'll need to restart the webserver by running the following command. Once done, we'll need to continue the web based installation as shown above. Finally, as the installation process is complete, we'll now need to remove the install directory as per the security reasons. In order to completely remove the directory, we'll need to run the following command. vQmod for OpenCart lets us to add extension modules to our store without modifying the core OpenCart code. To install vQmod in our OpenCart, we'll need to download the latest release of vQmod built for OpenCart from its Official Github Repository. To do so, we'll simply run the following wget command to download the latest compressed zip file of vQmod ie version 2.5.1 using its link. Then, we'll simply extract the file and move to the root of our opencart installation. 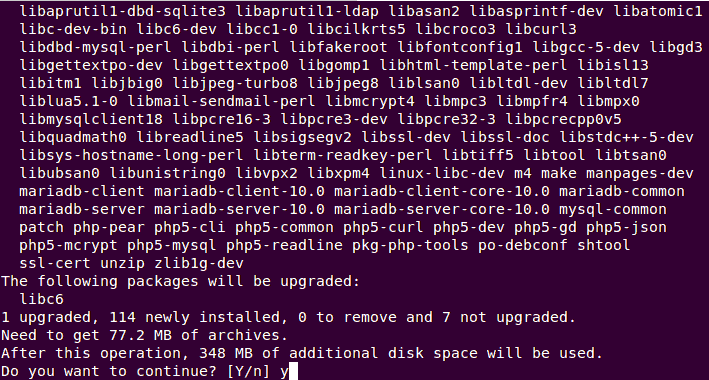 As vQmod recommends index.php and admin/index.php to be writable, we'll need to set their file permission to 755. 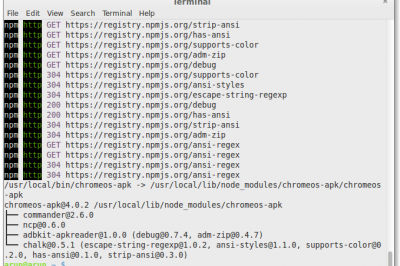 Once done, we'll need to install it by pointing our browser to the install directory of vQmod ie http://opencart.linoxide.com/vqmod/install/ in this tutorial. Unlike, the install directory of OpenCart, we shouldn't delete the install directory of vQmod. Thank you for being the first install guide that works!